If you like to nap, or, like me, need to nap sometime during the day to rejuvenate yourself, there's a good change you'll find Pzizz Relax for the iPhone to be a helpful piece of napping equipment. Pzizz Relax, like its longer-lived, more complex PC and Mac versions, Pzizz Energizer and Pzizz Sleep, enables you to create a customized, relaxing sleep soundtrack. 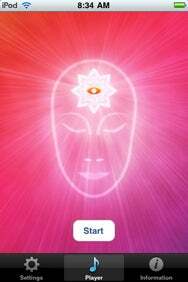 Out Of This World: The Pzizz Relax start-up screen looks like it came from Area 54, but the App’s effects are well-grounded. With a combination of soothing music, positive and calming words, and just-right wake-up alarm, I found Pzizz Relax did the trick for me nearly ever time I tried to take a midday 20- or 30-minute snooze break. With Pzizz Relax playing on my headphones, I was able to fall asleep quickly and wake up, when I was supposed to, feeling refreshed. That's what the app is trying to assist with. But there's a rub: I'm a small sample, and I have no trouble taking short naps, without Pzizz. However, my experience was positive, as it was when I reviewed the full-fledged Mac version more than three years ago. And although this review is based on my personal experience, it's worth noting that Pzizz Relax is very highly rated by iTunes App Store reviewers. So there are plenty of other people out there who are feeling pretty good about Pzizz. 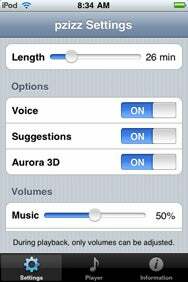 Customized Napping: Pzizz Relax enables you to customize the length of your soundtrack, while choosing whether to include voice, suggestions, and 3-D sound. Pzizz Relax is simpler and has fewer customization options than its bigger-box version, which is understandable (and forgivable) when you consider the price difference ($3 vs. $40 for Pzizz Energizer, the "daytime" version of the Mac/PC program), and, well, the processing capabilities and memory capacity of a full-fledged laptop or desktop computer compared to an iPhone. What you can do is choose your nap length (10-90 minutes), and separately adjust the volume of the voice and music/sound effects that combine to make a soundtrack. What Pzizz Relax does nearly as well as the full-fledged computer program is make unique relaxation soundtracks, and, as the company claims on its Web site, these soundtracks do sound "seamless." However, in my very enjoyable and relaxing tests, Pzizz Relax seemed to be obviously less "robust" than the Mac/PC versions, in that the spoken word phrases seemed more repetitive, and the composite soundtracks a bit less variable. I'm using the term "seemed" here quite purposefully, as I admit to having been half-asleep when noticing these things. That said, even sleepyheads can get bored of the same old same old, and for those who need some sounds to bring them down, repetition is sometimes counterproductive. That is what makes Pzizz Relax most impressive—it provides plenty of variety in a small package, and it works. You can even test it out for yourself before buying: Pzizz Technology provides a form on its Web site that allows you to request some free sample MP3 soundtracks.